I love to save money. Who doesn’t, right? It was tough to get started, though. I already felt like I was living on a tight budget and barely making ends meet. What was I going to cut? But when I took a hard look at where my money was going and prioritized my financial goals, I ended up saving more $175 a month. It’s freeing to live within your means and know where your money is going. These decisions aren’t easy, but it helps to distinguish between what you need and what you want. Before you start making cuts to your spending, you have to determine what’s a need, and what’s a want. While I’m not going to suggest you cut all your wants, I am going to ask you to see if there’s a cheaper way to get what you want. These are the easy pickings. Each one requires a single action that takes, at most, a few minutes of your time or a quick search on Google — and they can pay off, big-time. Cable, once considered a household staple, is quickly becoming an easy “no.” It’s expensive, and there are so many cheaper options. Whether you use Sling, Netflix, Hulu or a digital antenna, you just don’t need cable. You can get everything you want for $20 a month or less. Most people know it’s cheaper to cook at home than to go out. However, if you absolutely cannot imagine a life where you don’t go out to eat, find ways to make it cost less. Sites like Groupon or LivingSocial are great for finding deals — just make sure you’re going to use them. Alternatively, make sure your chosen restaurant has a happy hour and stick to that special menu. Going to a movie costs about $10 per person, while a rental from Redbox costs $2. Better yet, watch a movie on Netflix or Hulu! Now, you don’t have to become a homebody to cut back on expenses. Your community likely offers lot of free activities — go explore them! Ready to take the next step? You’ll have to work a little harder for these savings, but they’re still pretty close to effortless. You’ll need to repeat a simple action on a regular basis, whether that’s daily, monthly or every six months. The goal is to cut back on day-to-day expenses. When and how you use your appliances and gadgets can have a big impact on your bill at the end of the month. To save money, hold off doing laundry or running the dishwasher until you have a full load. If possible, skip the drying options and air dry your dishes and clothes. Turn off the lights when you leave a room and, if you aren’t already, use energy-efficient light bulbs. Lastly, unplug items such as chargers and laptops once they’re fully charged. To make this easy, just use a power strip and turn it off when it’s not being used. I live alone, and I save around $10 to $25 each month compared to last year’s bills, depending on the season. I can only imagine how much you’d save as a couple or family. A kind rep at my auto insurance company informed me you can ask to have a ticket or accident on your record removed if it’s been more than three years — and that can help you save money on your rate. If you have credit card debt, talk to your creditor and see if they will lower your interest rate. It’s amazing the things you can get if you just ask! You’ll likely be more successful doing this if you ask nicely and have a good payment record. If you want to get serious about saving money, you’re going to need to make changes in your lifestyle. Big changes mean big rewards! Just make sure you’re smart about how you approach these options. Your living space and transportation costs are likely two of your biggest monthly bills, and so they offer the potential for the greatest savings. If you move to a smaller space, you’ll not only save money on living expenses, but also make a few bucks selling some of the furniture you no longer need. Downsizing transportation costs doesn’t mean you have to go car-free. But could you cut how much you use your, thereby saving on gas and maintenance? Or if your family has more than one vehicle, could you downsize to just one? Can you walk to the grocery store? Bike to work? Take public transportation? Or get creative. For example, I do a lot of traveling in my customer training and support role, and my company pays for a rental or mileage, depending on how far I go. Since my territory covers three states, I rent a car at least twice a month. I don’t have to use my own car as often, saving me at least $30 a month in gas. There are a lot of different ways you can DIY to save money. A great one for warmer areas is a DIY dehumidifier. Just put rock salt in a colander over a bowl. The salt will pull the water from the air, and the bowl below will catch it. I only had one portable air conditioner to cool my apartment last summer. This DIY dehumidifier helped tremendously, and kept me from buying another portable AC. If you can’t find more ways to cut back on your spending, you need to start making more money. Try starting a side business or increasing your salary. One friend reached out to me when her boss was looking for some temporary help drafting briefs for clients. I ended up making more than $4,000 in three months, which played a huge part in paying off my credit card debt. Your Turn: Have you tracked your “wants” versus your “needs” in your budget? How much money did you save? Liz Stapleton blogs over at Friday Night Shenanigans, where she writes about paying off her debt while creating a beautiful life for herself through DIY. By implementing these strategies, she has saved over $175 a month. 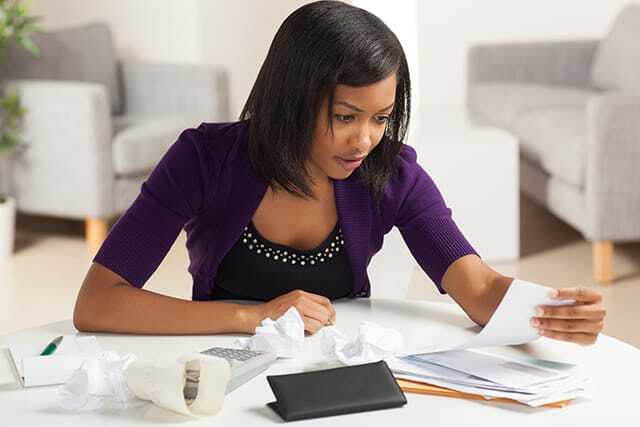 To help you, she put together a FREE checklist you can use when looking to save on expenses.